Armitage Non-Slip Stainless Steel Dog Bowl makes meal times easy! 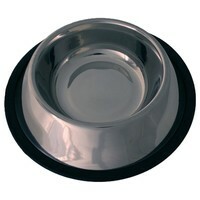 This stylish stainless steel feeding bowl is the ultimate in doggy dining. The built-in handles allow for steady carrying whilst the anti-slip rubber ring around the base of the bowl keeps it extra sturdy and minimises spillage. These durable bowls are rust, chip and peel resistant and even chew proof, so you know they will stay looking this good! Dishwasher safe for ultimate hygiene.